The only authentic replica anywhere in the world of the 19th Century desert ranch home made famous in the television series The High Chaparral began as the All-American Dream for Sue and Ronnie Rubino. Being from Pennsylvania, Ronnie admits that he had never seen anything quite like the West. He also admits that his initial impression of the house on the show was that it "looked like a mud shack on the moon." All that was to change when he and Sue married and decided to honeymoon in Tucson, so they could see the desert with their own eyes. It was the trip to Tucson which convinced Ronnie and Sue to move to the Southwest. 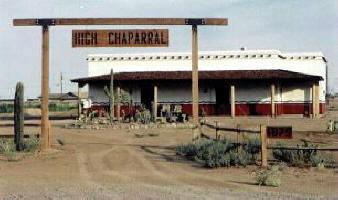 They chose Yuma, a place that was not only the location of one of the West's most notorious prisons, but a place often mentioned in The High Chaparral. There, Ronnie opened his restaurant, specializing in what the locals refer to as "the best pizza in town." But life in their rented house not far from the restaurant was not what Ronnie had in mind for his kids. Coming from the countryside of Pennsylvania, he wanted his kids to see what life in the country was like, and he began to scout around Yuma for a small patch of land on which to build his dream home. 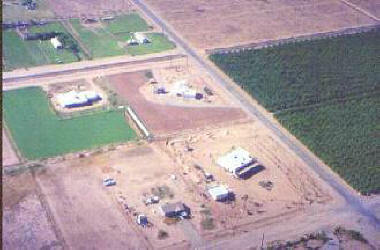 South of Yuma is the tiny community of Somerton, and right on the northern edge of town lay a corner acreage just begging for Ronnie to notice it. Once the deal was struck, he set about formulating plans for his dream home. He had been in high school when The High Chaparral was originally telecast, but by being the first TV Western to break the boundaries of the genre with the use of color and outdoor location shooting, it had made a deep impression on him. 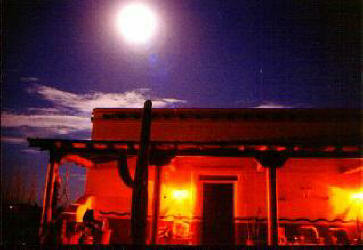 He wanted his dream home to capture the mood of the desert -- the stark tan and green colors of high noon softened with the adobe peaches and corals of the spectacular sunsets. Ronnie set his goal to live in a duplication of The High Chaparral ranch house. Ronnie sent a letter to David Dortort, the creative genius and executive producer of The High Chaparral (and Bonanza), asking for permission to copy the house. He knew it was a long shot, but to his surprise, he received a documented letter two weeks later not only with Dortort's enthusiastic permission, but with Dortort's blessing and complete cooperation! All that remained was for Ronnie to trek to Old Tucson with his tape measure. He admits to making so many trips to glean measurements and details that he's now probably the foremost authority on the Old Tucson set house! There are hundreds of interesting little details which add to the charm of the house, and Ronnie admits that he is still not done with all he wants to accomplish. 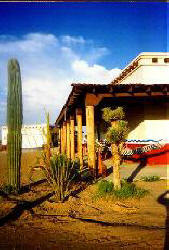 For instance, last year, he accidentally located the perfect saguaro to plant at the front of the house. A neighbor down the block was wanting to relocate one, and he offered it to Ronnie. It was only when it was delivered that Ronnie noticed it had one pointing arm at about the same location as the one in Old Tucson. Was Ronnie thrilled? You bet. He planted it to look the same as the one on the set. He also gathered a huge lot of saguaro spines to line the rafters outside the office area. Now, that area looks just fine without this addition, but it's this sort of attention to detail which makes the house believable. Also, the rafters are there for decoration only; they are not load-bearing. When Ronnie went to get building codes for this aspect, he got all sorts of strange looks. Ronnie also got raised eyebrows when he insisted there be no windows across the front of the house. The original house in Old Tucson had only two double-doors, and this was what Ronnie wanted, but most building codes call for windows. To keep unwanted varmints from entering when the doors are open, he had craftsmen construct special screens, which he then slips into the door frames. When he opens the front doors and the side doors, he gets a wind tunnel effect which is surprisingly cool. There was also the problem of the kitchen. In the television series, the kitchen is a wood-burning area somewhere off to the left side of the house, only this wouldn't work in modern times. Ronnie's kitchen is located behind the fireplace wall, and in keeping with the Southwest desert appeal, he has chosen Mexican Aztec yellow Formica counter tops and light walnut cabinets with golden highlights, which perfectly compliment the terracotta tiled floor. All the appliances are white, and Sue has chosen some bright Mexican accessories in her curtains and linens and wall groupings which gives the whole area a feel of belonging with the rest of the house. She has even the cutest set of canisters on the planet, which she keeps on the counter next to the sink. It resembles a Mexican village in graduated sizes for flour, sugar, coffee and tea. There are other areas which Ronnie wants to emphasize, too. Between the two doors at the front, he has already installed the gun rack, and it's authentic down to the smallest detail. Although his furniture is modern, he's kept it as rustic in appearance as is possible and still remain comfortable. The lamps were made by Don Collier, who played ranch foreman Sam Butler in the television series. The ladder against the wall is just for effect at this time, but there are plans to add a trap door to the roof. Of course, once he does that, Ted Markland has volunteered to come camp on the roof ala "Reno-on-guard." Ted Markland played Reno, a ranch hand. And, plans are under way to add the bunkhouse. The windmill and water tower went in last year, and once the bunkhouse is finished, Bob Hoy, who played Joe Butler in the series, volunteered himself and Ted to break it in proper. There are all sorts of things still to come. 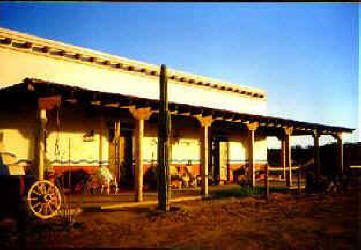 As a side note to Ronnie's house story, there is the story of Amos, Ronnie's "Vaquero." Amos Seveses lives right next door, and when construction started on the site, Amos wasn't about to let Ronnie run into problems with the local labor force. Yuma is a border town, and everything Ronnie was doing was done the old way as much as possible. This meant working with Mexican craftsmen as often as the American side of the border. 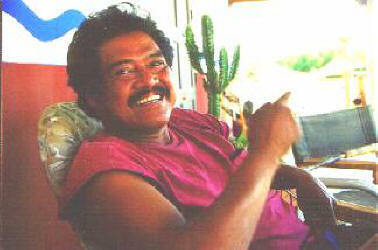 Part Navajo, part Apache, and part Filipino, Amos speaks enough of the area languages to be overseer when Ronnie is absent. He is also somewhat of a jack-of-all-trades, and he's saved Ronnie thousands of dollars by pitching in and helping where needed. 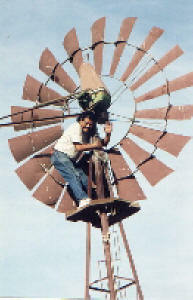 For instance, when he learned Ronnie was looking for someone to put the windmill together, he shinnied up the rigging and worked it out himself. Perhaps the bravest action took place when Ronnie fired the contractor. Convinced the fired man intended harm to the building and its contents, Amos grabbed his gun and stood guard on the house until completion. It was one thing for Ronnie to want his dream house and quite another to actually see it come to pass. In fact, during construction, Ronnie began calling his dream, "The Hell Chaparral." It's best to let Ronnie tell his own story, a nightmare experience which was first told in the September 1998 issue of the Mark Slade Fan Club Newsletter. It is reprinted with permission and with a few slight modifications to keep it current. We know you will enjoy it.